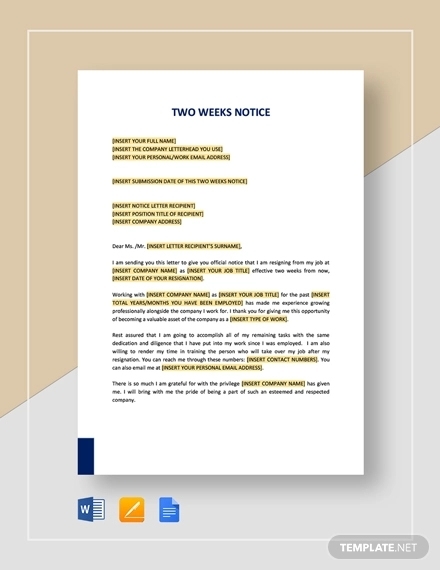 As important as the first impression, a two weeks notice letter is a formal letter that creates a lasting impression that an employee would leave to a former employer. This would be in fact, still be helpful as anyone calling your previous company would get positive feedback if you left the company in good graces. 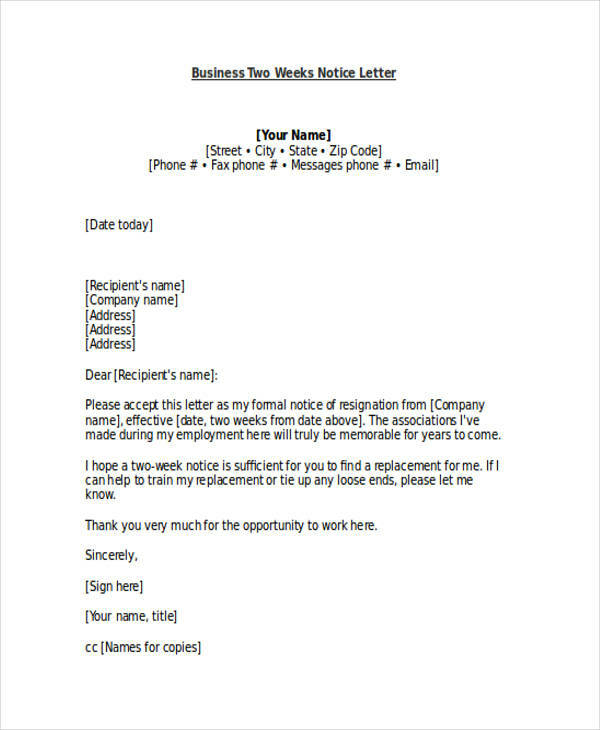 Examples of two weeks notice letter can be found throughout the page. 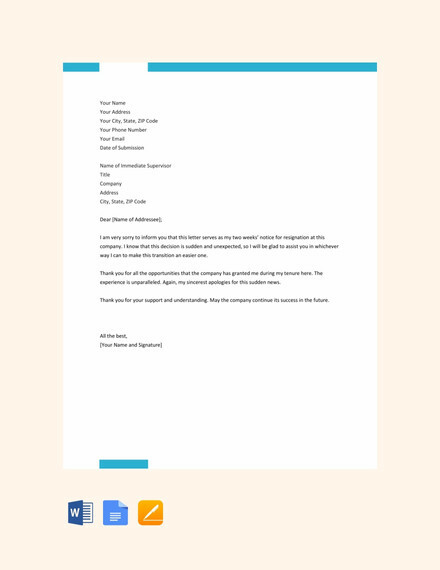 This type of letter is the exact opposite of the application letter in that it gives notice to the employer of the resignation of the employee. All examples in the page are available for download. 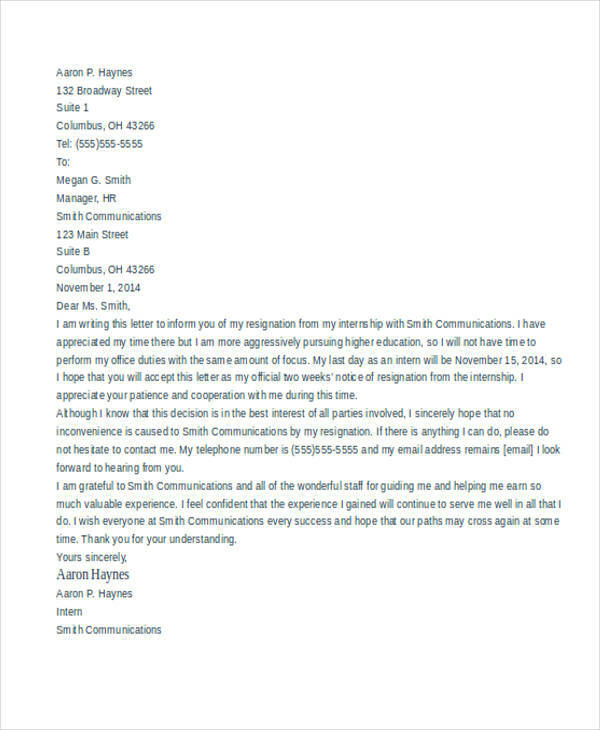 Your first line must plainly indicate your intention of resigning. 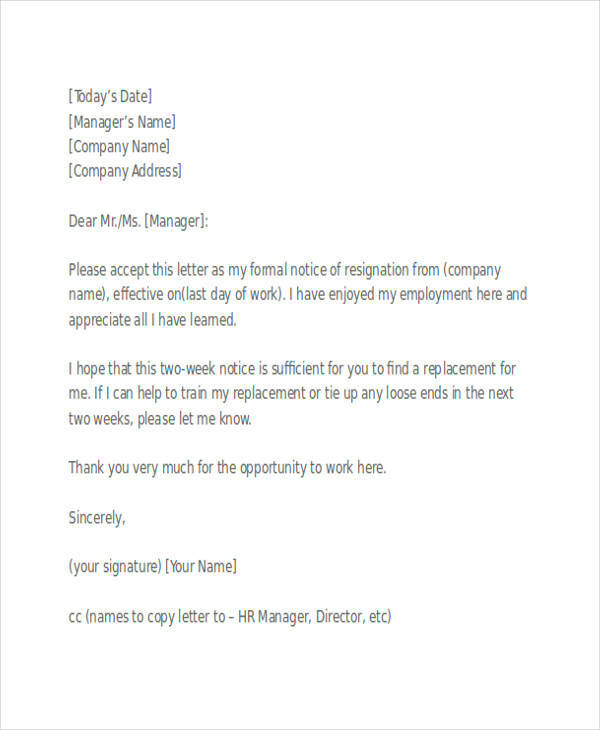 A minimum of two weeks must be provided for the resignation letter to take effect. Say thank you for the things you enjoyed while on the job. Your reason for quitting is an optional matter to be included at your own discretion. 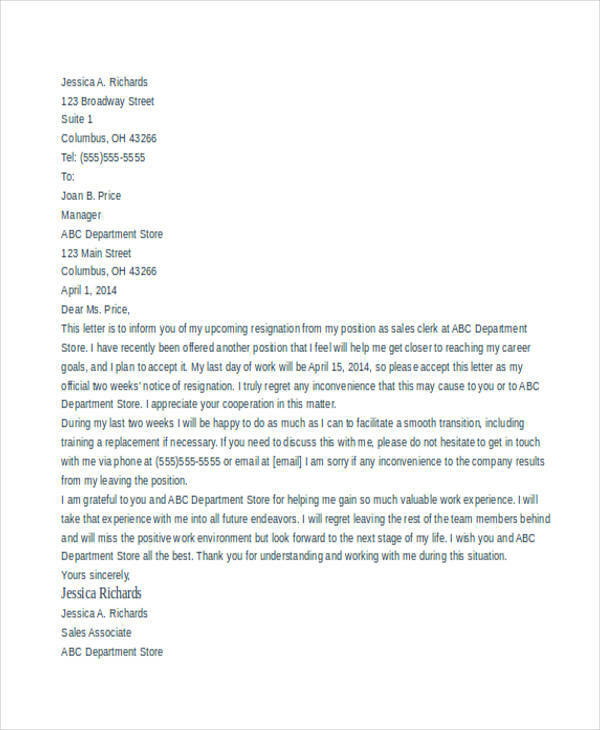 Make sure to deliver the letter directly to your supervisor or manager. 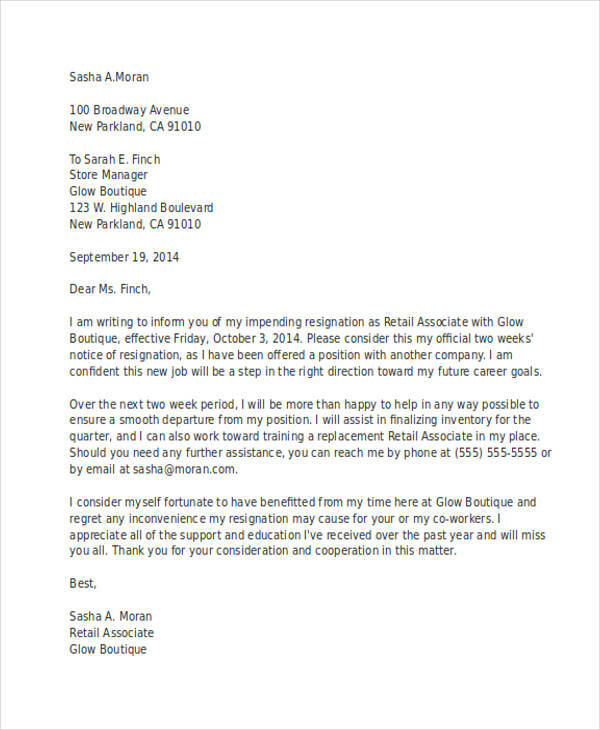 The closing of a two weeks notice letter are in some ways similar to that of an acceptance letter. 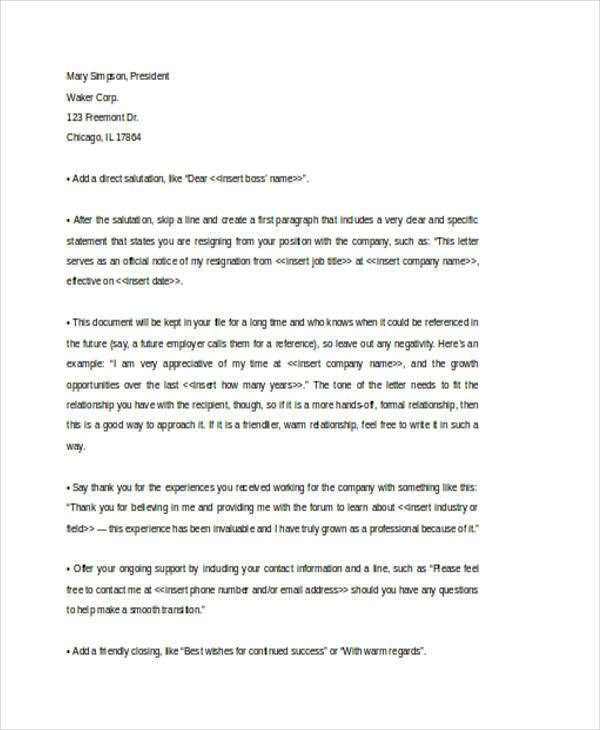 Both end by mentioning the opportunity of having worked for the company. In most cases, leaving in good terms with the company always generate a good reference for any future job ventures. 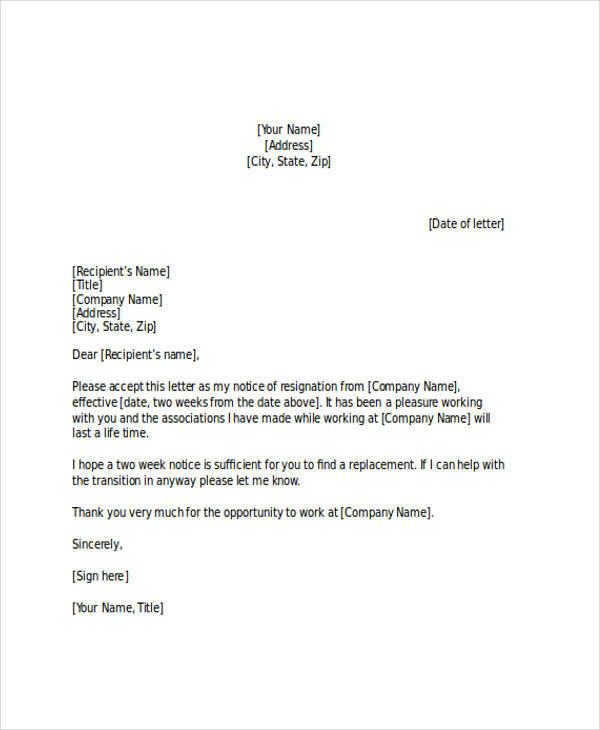 Most of two weeks notice letters mention gratitude towards the employer for everything they have done so far and the polite goodbye for the employee. 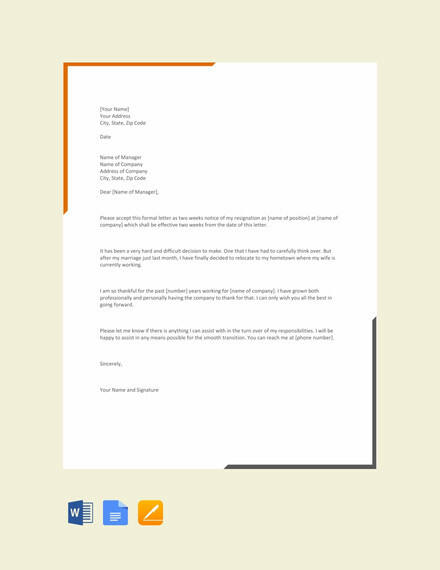 Some also end with a mention of an acceptance letter to another company and the prospect of further growth with the new company. 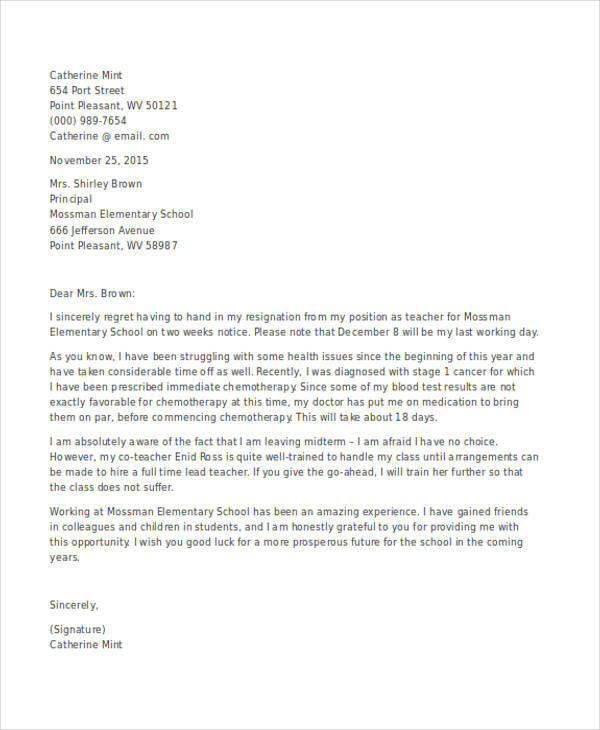 Other types of letters are found in this site, such as recommendation letter, thank you letter, and termination letter. Things you have enjoyed most at the job. Mention the things you love or love doing at the previous job. It may for example be access to technology or simply the act of working itself. 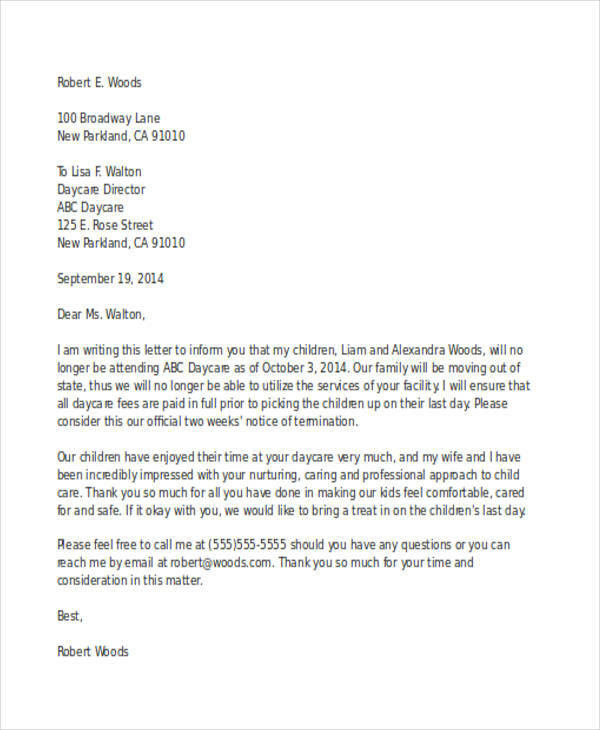 The example printable two weeks notice letter is an example stating such reasons of gratitude. The people you have met while doing your job. While in the process of doing your job, you have met new people and enjoyed your stay at the company due to their presence. 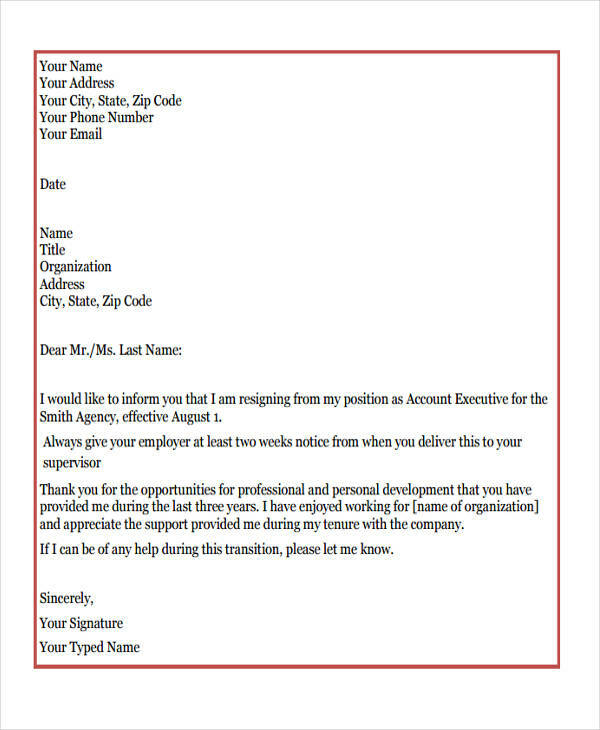 The example professional two weeks notice found on the page is a good sample for this reason. The things you learned being on the job. These are the skills you have attained or gained while being on the job. 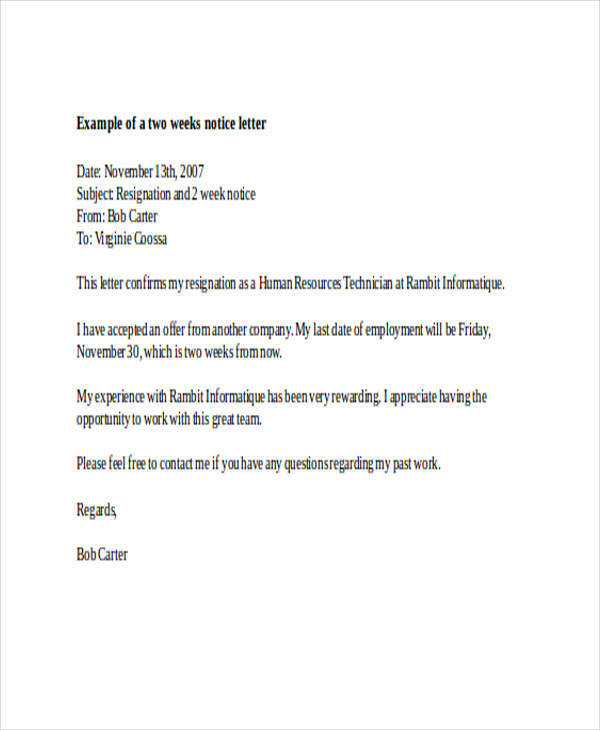 The formal two weeks notice example found in the page is an example of such reason. Happy memories that you take away from the experience. These talk about the good experiences you had exchanged when you were doing your obligations to the job. 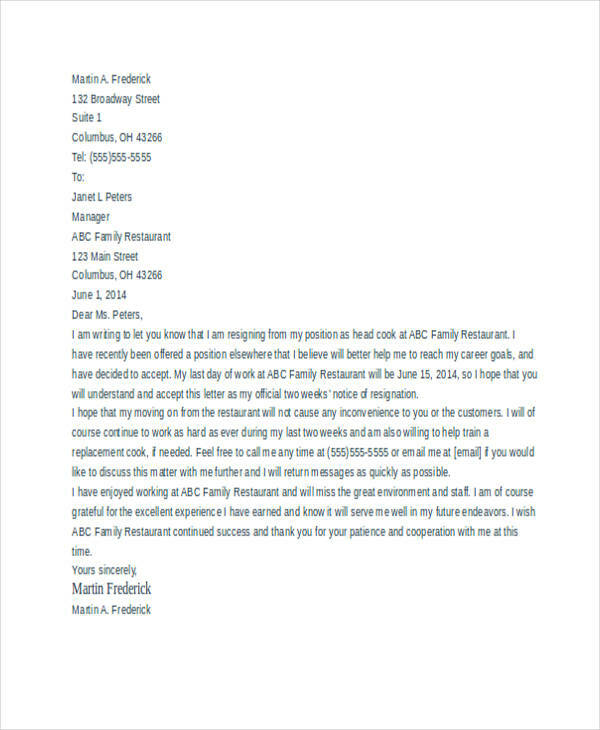 The notice letter of two weeks for the retail job shows this kind of gratitude towards the job the employee previously held. 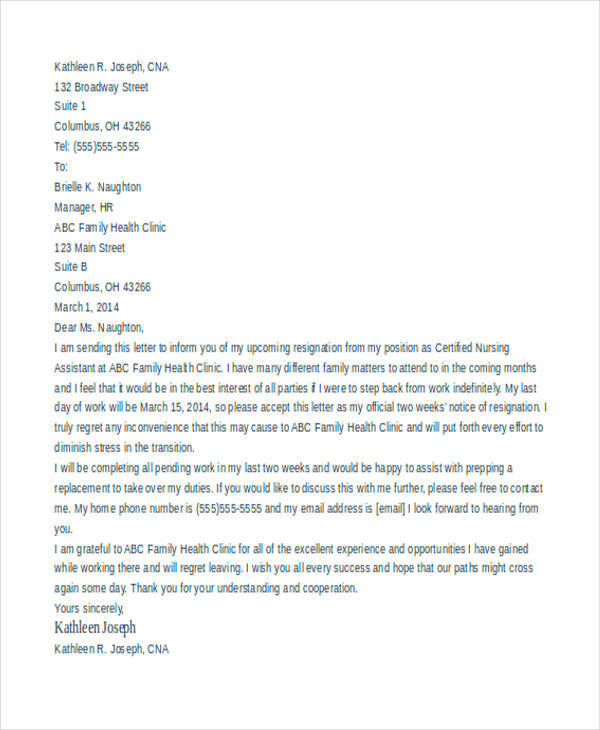 No matter what the reason for gratitude, it is vital and may prove useful later on to include an expression of gratitude in your two weeks notice letter since in your future application letters, your previous company will always be featured and it wouldn’t be such a bad idea to leave a good impression on a former employer who may provide comments or recommendation to your future employer. 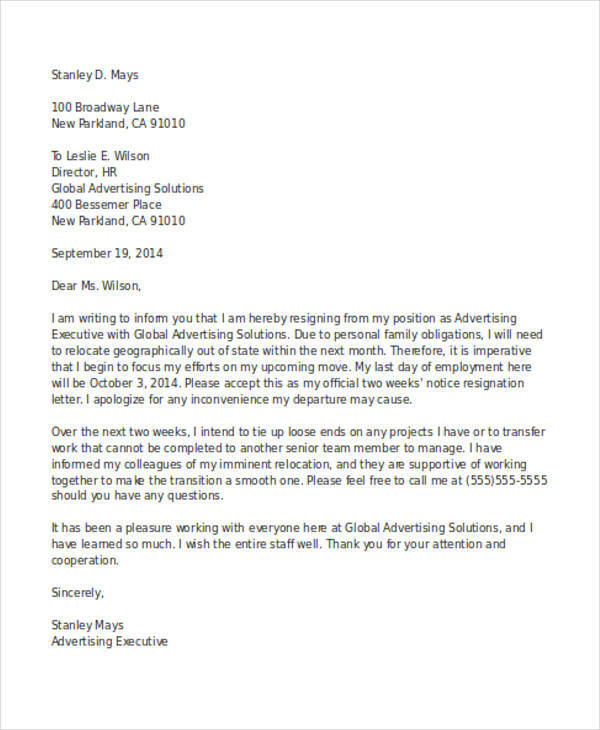 What Does a Two Weeks Leave Notice Look Like? State that you are leaving the job. Be objective and keep your emotions in check. 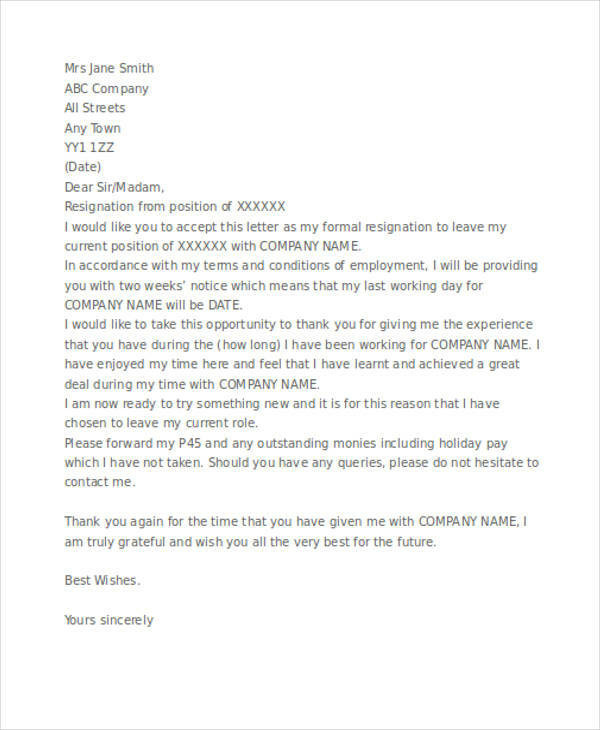 Be sure to review your job contract agreement and comply with the formal notice period for resignation. 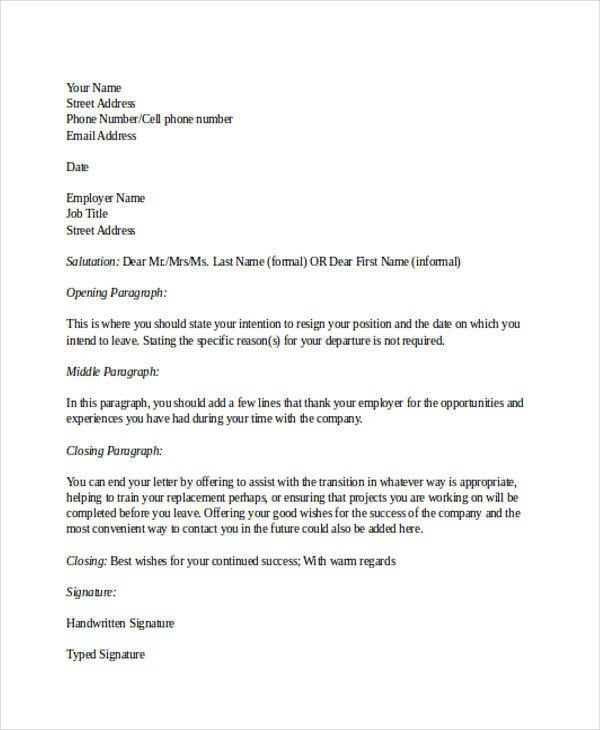 Include your readiness in the handover or transfer of your job responsibilities in the most appropriate manner. Always ensure to include positive experiences and valuable experience you have gained while being employed by the company. 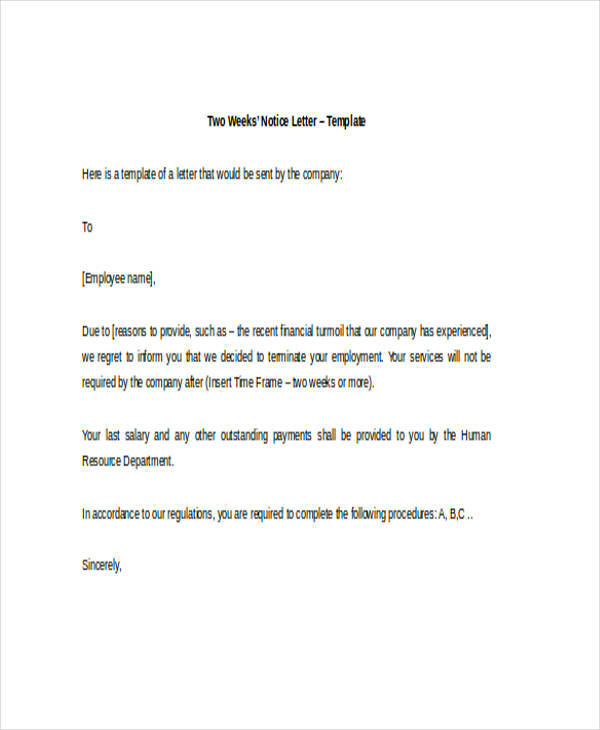 End the letter in a positive note thanking the employer for giving you the opportunity to work with the company or any of its affiliates. 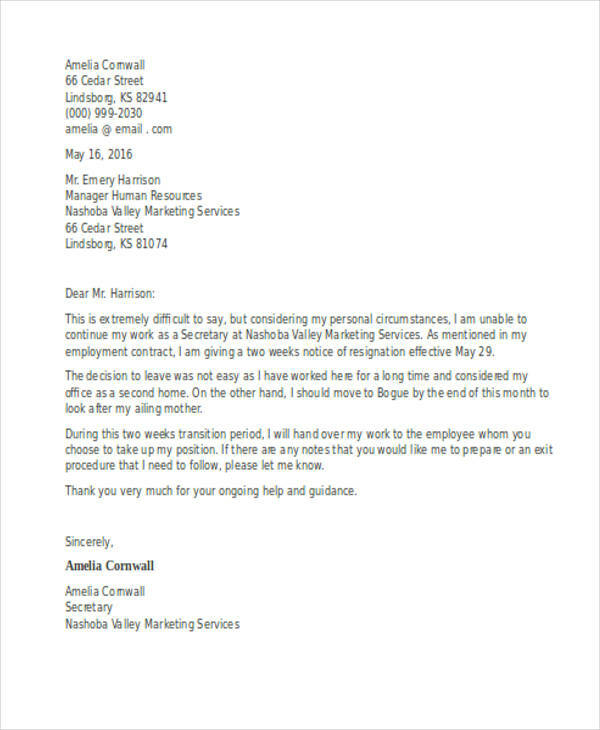 It is not always easy to render resignation from any job or employer. Many factors are usually considered before arriving to a certain decision or conclusion. 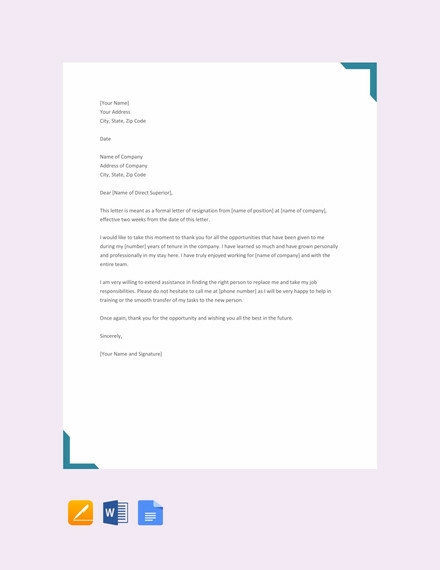 As with any other kind of letter, whether an acknowledgment letter, offer letter or appointment letter, it is always important to leave with a positive outlook and let that outlook influence the next journey you will undertake.